in Thousand Oaks. Photo by Graham Martin. As we look forward to our 25th anniversary in August, we of course have to look back at 2011. It was both a year of growth and important transition. CORBA became a chapter of the International Mountain Bicycle Association (IMBA). 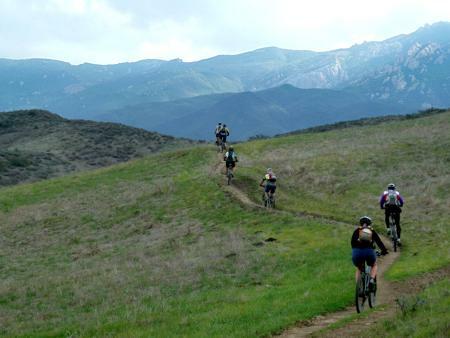 As a founding member of IMBA, CORBA saw the value of partnering with IMBA’s strength and reach to gain even more members and raise awareness of the ongoing goals of shared use trails in greater Los Angeles and Eastern Ventura Counties. Already we have seen an influx of new members. California State Parks “change in use” process finally began after several years of non-compliance. CORBA’s efforts to make sure this process was fulfilled was and will be unwavering. Currently the Yearling/Lookout Trail conversion/realignment in Malibu Creek State Park is undergoing review and work could begin as soon as this summer. Our blog article discusses this process further. CORBA established regular quarterly meetings with both State Park and National Park Service officials. These meetings have garnered a new and improved level of communication and cooperation. CORBA went from a single-day fundraising event (Fat Tire Festival) to several smaller events which involved some of our local bike shop supporters, as well as the Fat Tire Fun(d)raiser, a scaled down version of the festival that focused more on riding than “festivaling”. If you know of a local bike shop that would like to host a fundraising event in their store, please send me an email at mark@corbamtb.com. 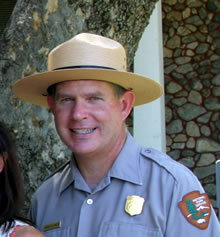 Santa Monica Mountains National Recreation Area (SMMNRA) Superintendent Woody Smeck accepted the position of Deputy Superintendent of Yosemite National Park. (Read our blog article on Woody.) While this transition is yet to be complete, we can assure you of one thing; the new superintendent will need to be educated as to the significance and importance of mountain biking in the SMMNRA, and how intertwined mountain bikers are within the trail community. While it is likely the new superintendent will be responsive to the mountain bike community, we’ve seen over the years that different individuals come with their own sensibilities and it is sometimes the case that those sensibilities do not always align with the previous administrator’s positions. 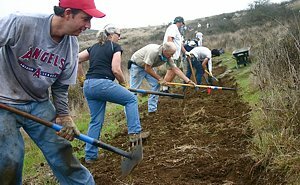 State Parks implemented a more comprehensive volunteer trail work training program, requiring a greater level of commitment. CORBA members Steve Messer and Steve Clark stepped up and completed the training, enabling us to move forward with much needed trail improvement projects. 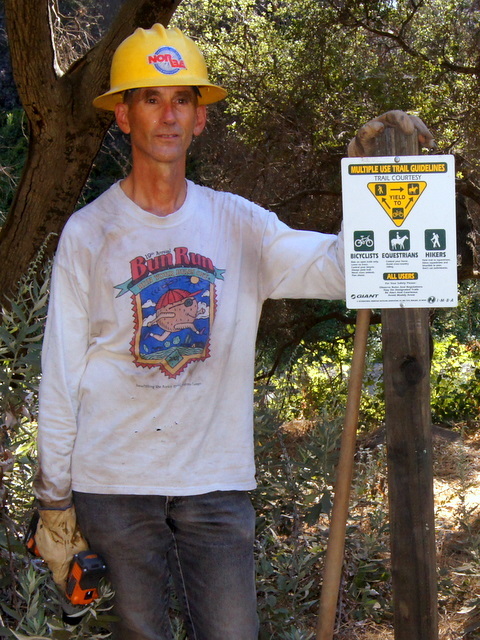 In 2011 CORBA contributed significantly to trail work and maintenance in the SMMNRA, Conejo Open Space Conservation Agency (COSCA), City of Glendale, and the Angeles National Forest (enhanced greatly through a grant from REI). In addition to our Youth Adventures Program, which ran 19 outings at Malibu Creek State Park and Paramount Ranch and served dozens of at-risk youth, CORBA introduced the Kids Club, and thanks to a dedicated and passionate group of mountain biking parents, regularly scheduled monthly rides took place and introduced mountain biking to a whole new generation of mountain bikers. This year also marks the 20th anniversary of the free Introduction to Mountain Bike Skills class. Last year saw the best turnout ever with a total of 300 participants, which included two special classes provided to the Mountain Bike Unit (MBU). In fact, the MBU has made the class mandatory for all new members. Even with a quarter century of advocacy under our collective belts, there is still much to be done. Consider this: There are many miles of singletrack trails closed to bicycles in the SMMNRA, trails that are exactly the same as ones that are open to bicycles. As State Parks moves forward with their trail conversion process (a painfully slow one at that), we must be diligent and ensure that they stay the course. And of course I sill implore everyone to simply slow down for other users. The primary complaint about mountain bikes on trails is that “they go too fast and scare us.” If you slow to other users’ speed on the trail, you remove the one justifiable complaint about mountain bikers. It’s easy to slow down, and it makes the situation more pleasant for everyone involved—a true win/win situation! Membership Renewals: Choose CORBA as your Chapter! Many of our members have or will be receiving renewal notices for their combined CORBA/IMBA membership. Since CORBA became a chapter of IMBA in April 2011, you no longer need to join two separate organizations (local and national). Your individual and family membership dollars support advocacy, outreach and other efforts at both the National and local levels (Corporate and Retailer memberships are presently available only for IMBA). However, to ensure you remain a member of CORBA, there’s one extra step. Be sure to choose CORBA as your local chapter so that your dollars will more directly impact local projects and advocacy. 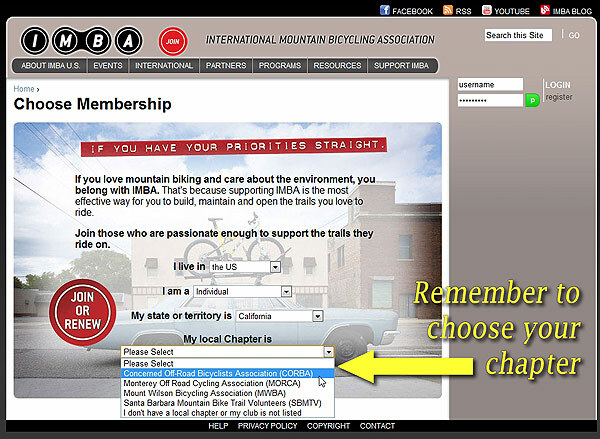 Of course, you’re free to choose a different chapter if there is another that is more appropriate, such as our neighbors and partners at the Mount Wilson Bicycling Association, IMBA’s newest California chapter. You can also avoid the extra step by going to CORBA’s membership page directly. Donations to CORBA, over and above your membership, stay local and are also tax-deductible. You can make a donation at http://corbamtb.com/join/donate.shtml. CORBA is proud to be an IMBA chapter, working together to strengthen the collective voice of the mountain biking community. We thank you for your ongoing support. 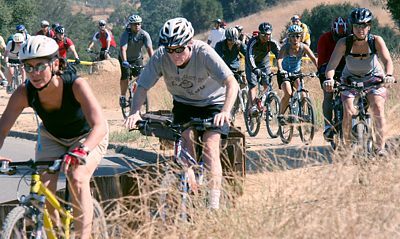 In recognition of extraordinary dedication and contribution to mountain biking recreation and open space trails in Los Angeles and Eastern Ventura Counties, CORBA announces its recipients of the 2011 CORBA Award. When it comes to social networking, we can always count on Wendy to reach out through the internet to generate excitement for CORBA’s events and activities. 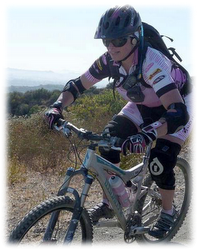 She also has worked tirelessly coordinating and assisting with several CORBA events over the past few years, in addition to organizing and leading rides for the North Ranch Mountain Bikers, a CORBA-supporting club. She is also an outspoken advocate for responsible mountain biking. Her enthusiasm is infectious, and her dedication is relentless. 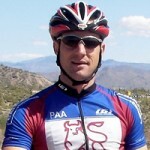 Matt helped organize the SoCal High School Cycling League in 2008 and serves as the organization’s Executive Director. The organization currently comprises nearly 30 high school teams and more than 300 riders. Under his guidance, the league has grown substantially over its four year history, bringing hundreds of new student athletes–and many of their parents and friends–into the sport of mountain biking. Matt and the League emphasize that a major component of participation in the league is stewardship of the trails, including an appreciation of–and volunteering for–trail work and maintenance. The league’s impact on the sport in Southern California is already having far-reaching effects, with many student racers having moved on to careers in cycling and the industry. Banner has had a long-time love of trails. He began mountain biking on El Prieto two decades ago, and soon realized that it needed upkeep. He has since spent many off his days off happily and tirelessly contributing to the trail’s upkeep, sometimes with help, often without, and always just for the love of it. Over the past few years he has formalized his love of the trail and his relationship with the National Forest by adopting the trail under the moniker, “Friends of El Prieto.” He has contributed to many Eagle Scout trail restoration projects as trail boss and advisor on this and other trails, and serves as coach and mentor to the Crescenta Valley high school mountain biking team. His long time involvement in the mountain biking community has inspired many to become active and responsible mountain bikers. 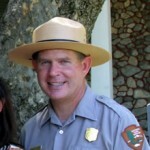 As Superintendent of the Santa Monica Mountains National Recreation Area (SMMNRA) for the past 10 years, Woody has elevated the SMMNRA’s stature in the National Park system, and worked with politicians to help them understand the importance of National Parks near developed urban areas. He was also instrumental in improved inter-agency coordination and cooperation with the California Department of Parks and Recreation, the Santa Monica Mountains Conservancy, the Mountains Recreation and Conservation Authority, and other agencies in the SMMNRA. For the mountain bike community, Woody was always accessible, fair, and honest in his dealings, making it clear to his peers that responsible mountain biking is manageable on public lands. On March 30 Woody will become Deputy Superintendent at Yosemite National Park. The above recipients join a long list of past recipients of the CORBA award, all of whom have left an indelible mark on the sport of Mountain Biking in our area and beyond. It is the combined legacy of all the CORBA award recipients that has helped shape the sport in Southern California, and will continue to do so as the sport grows. It is thanks to them that the opportunities to enjoy mountain biking exist in its current form. These deserving 2011 recipients will be presented with their awards in the coming months as their busy schedules allow. We congratulate them, and on behalf of the entire mountain biking community and especially CORBA’s members and supporters, we thank them wholeheartedly for their contributions to our community. California State Parks (CSP) is hiring a crew to work on Rogers Road Trail in Topanga State Park and Will Rogers State Historic Park. The work will include brushing to remove the overgrowth and some tread work to remove the ruts. The bridge on Chicken Ridge will be repaired and upgraded, and new signs put up to remind riders (bikes and equestrians) to walk through this section. CORBA will be supplying bicycles and B.O.B. Trailers to allow the trail crew volunteers easier access to the remote work sites. The work is expected to take place from February to June 2012. We will post notice of the work schedule and impacts to trail users as it is supplied by State Parks. The Guadalasca Trail in Point Mugu State Park will also undergo some substantial improvements over the next year or two. First, the lower section (part of the old ranch road), will be brushed out to allow access for motorized equipment. The existing culvert drains will be removed and converted to level crossings. Part of the newer section of the trail will be rerouted and in the process will add 1/4 to 1/2 mile to its length. Some of the switchbacks could be converted to climbing turns, and rolling dips will be added to help control erosion. Using IMBA-influenced designs, sinuosity and pinch points will be incorporated into the rerouted section to reduce downhill travel speeds. This will help reduce conflicts with other trail users, including climbing mountain bikers. CORBA congratulates Woody Smeck, Superintendent of the Santa Monica Mountains National Recreation Area (SMMNRA) on his new appointment. He was always accessible, fair, and honest in his dealings with the mountain biking community. There is more mountain bike access on NPS land in the SMMNRA than anywhere else in the country. Woody has been clear that responsible mountain biking is manageable on public lands and has expressed that view to his NPS peers. We owe him a huge debt of gratitude. Next CORBA Kids Club ride will be Saturday January 7th at Sullivan Canyon. See our Rides Calendar for details. Saturday January 7th is the next skills clinic.